The protective garment or "lead apron" is a critically important item for the protection of staff involved in work where fixed physical barriers are not available or feasible to shield radiation scattered from x-ray equipment or patients. The detrimental effects of x-ray radiation are well understood, and the need for good quality aprons that provide sufficient levels of protection for the work being undertaken is not disputed by anyone. Further, the use of radiation in almost all applications is tightly controlled by local regulatory authorities, but despite this, it is a remarkable fact that in most of the world, Australasia included, the claims apron manufacturers make, and the labelling they fix to their garments often does not give an accurate picture of the apron’s true protective abilities. This article is the first of a series to be published over the next few issues of Spectrum that will focus on the lead aprons used by staff in diagnostic imaging and interventional procedures, and the factors that have contributed to the situation mentioned above. 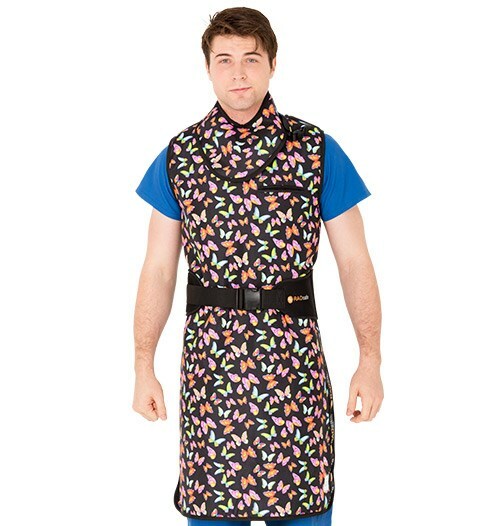 The intention of these articles is to provide interested readers an insight into what aprons are made of, how they work, what the metrics of protection are and how they are measured, and most importantly, how to interpret the marketing information provided by manufacturers and suppliers engaged in the business of selling aprons. 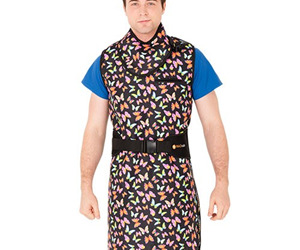 People required to make lead apron purchasing decisions will hopefully find these articles helpful, as will anyone who is curious as to why two aprons of the same size and with the same claimed level of protection can weigh substantially different amounts. Naturally there is a demand from the market for lightweight protective garments because weight is a very significant contributor to overall comfort. Modern medical practices often involve complex and long procedures, requiring aprons to be worn for extended periods of time, and fatigue or injury are very real issues for wearers. Unfortunately, it is unavoidable that adequate attenuation of diagnostic x-ray radiation requires a significant mass of material and so protection, and wearing comfort are somewhat in competition with each other. A compromise needs to be made whereby an adequate level of protection is provided, and the wearer afforded good quality of working life. Apron manufacturers have responded to this challenge in the last several decades by producing aprons that use materials other than lead as their key attenuating agent. The accepted testing laboratory measurement methods available to determine the attenuating ability of aprons have not been truly representative of actual exposure situations for wearers though. As a result, the market is full of non-lead or reduced-lead aprons with weights significantly less than the weight of the equivalently labeled lead based garment. Often, these claims are quite inaccurate in terms of actual protection. This is not to say that manufacturers are deliberately misleading their customers. Rather, a shortcoming in testing methods has existed that has provided the so-called lightweight non-lead garments an apparent advantage. The situation has begun to change with the recent publication of new measurement methods for testing laboratories to follow. These methods give more representative measures of the attenuating ability of a nonlead apron when compared to a lead apron, and so a more accurate picture is beginning to emerge. A consequence of these changes will not necessarily be that apron weights will increase. Instead, it is hoped that the labelling fixed to aprons to indicate their protective abilities will be a more accurate reflection of reality. Unfortunately, it takes some time for new standards and methods to be adopted, and in the meantime, manufacturers will continue to seek an “edge” by making statements based on results obtained using the older standards. As mentioned, the lead apron has evolved considerably in the last century. Regardless of the construction particulars, all aprons rely on the same radiation interaction mechanisms to achieve their attenuating abilities, and these mechanisms require the use of high atomic number elements. Conventional textiles used for garment manufacture do not contain high atomic number elements, and so some means is required to incorporate these elements into suitably flexible and workable substrate materials. Historically, the substrate material used was rubber, and lead has been the preferred attenuating element because it has a high atomic number, exists as a stable pure metal, and does not react with other materials. It can be readily powdered to a fine particle size, and in this form can be mixed into the uncured rubber. Once cured, a flexible sheet of attenuating core material is obtained that can be cut into patterns and stitched into garments. Early aprons materials were not particularly flexible, and styles were limited to “front and back over-the-shoulder drapes”. More recently synthetic rubbers, and PVC vinyls have been employed, and these materials can be cast into thinner layers, affording more flexibility. This has allowed for the option to manufacture actual fitted vests with companion skirts as a means of providing full protection to the human trunk, but with the advantage that weight is distributed to the shoulders and the hips. Other elements with moderate to high atomic numbers have become popular as attenuating materials. In addition to lead, elements such as tin, antimony, barium, and bismuth are the most commonly employed today. The primary driver for their use has been to offer apparent weight advantages, but concerns about the health and environmental impacts of lead have also motivated the use of these other elements. The evolution of the “lead apron” is shown in the images 1-3, which covers a time span of approximately one century. In some regards, it would be fair to say nothing much has changed, whilst in others, a number of innovations have taken place. Image 1 of a protected worker has been obtained from material provided by the International Atomic Energy Agency (the IAEA), and is dated 1916. Note the obvious inflexibility of the apron material, which almost looks like it could have been constructed from straight lead sheeting. The garment modelled in image 2 is typical of what was available in the 1970s. The core material is lead rubber based. Despite the apron covering both front and rear, note the gapping areas at the sides potentially exposing sensitive tissues to unattenuated radiation. This article has served as an introduction to the humble lead apron, and has touched upon a range of topics that in the forth-coming issues of Spectrum will be expanded upon. Real world measurement data and diagrams will be used to explain how the measurement standards work, and most importantly, what to look for when navigating the critical issue of weight vs protection in selecting suitable lead aprons.